Our hunting blinds are designed with durable, UV-resistant, vacuum-formed polyethylene construction so it is built to last. These features will keep you warm, dry, and protected from the toughest outdoor conditions, giving you the opportunity to truly enjoy each and every hunt! - Clear plexiglass window kits. Our Lightweight material makes it easy to move from one stand location to another. 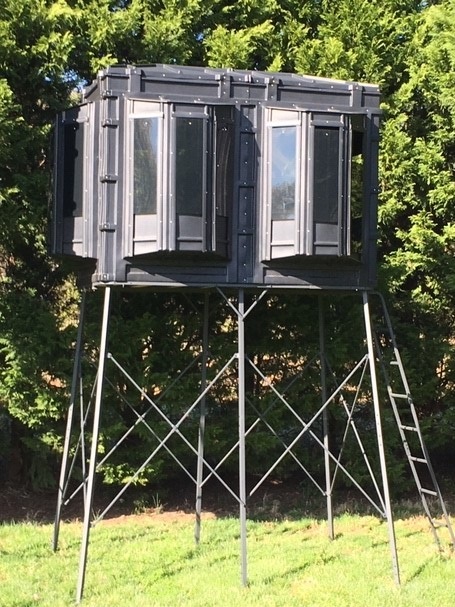 Use either as ground blind (requires a minimum 48" x 48" floor) or build a base platform to your own specific height. We also offer 10-feet towers (see below). Size: 48" x 49" x 74.5"
Size: 49" x 96" x 74.5"
Size: 72" x 96" x 74.5"